Background: SOX11 is a transcription factor that has role in central nervous system development, it has found that this marker expressed in nuclei of mantle cell lymphoma and may play vital role in diagnosis and pathogenesis of mantle cell lymphoma. AIMS: To evaluate the diagnostic role of SOX11 immunohistochemical expression in mantle cell lymphoma. Materials and Methods: A cross sectional study was designed, a total of 62 left over tissue samples (paraffin block of bone marrow biopsy) were included in the study. All the samples were taken from the Medical city/ teaching laboratories, and presented during the period 2014-2016. Cases diagnosed according to the WHO classification of mature B-cell Neoplasms with 26 cases having CLL/SLL, 17 were mantle cell lymphoma and 19 cases with follicular lymphoma. All the practical steps were carried out in teaching laboratories department of pathology and forensic medicine/ Al-Nahrain University - Collage Of Medicine. From each block, two sections were taken, and one were immunohistochemically stained for SOX11. And other section stained for haemtotoxylin and eosin stain. Results: In MCL, nuclear staining of SOX11 was seen in 16 (94.12%) of 17 patients, SOX11 nuclear staining was also seen in 1 case (3.85%) of 26 CLL/SLL cases, and 0 (0.0%) of 19 patients with FL. Furthermore, compared with CLL/SLL and FL, the positive rate of SOX11 nuclear staining was significantly higher in the MCL samples (P < 0.001). In addition SOX11 nuclear positivity had high sensitivity (94.12%) and specificity (97.78 %) in diagnosis of MCL compared to Cyclin D1. Conclusions: SOX11 is a powerful diagnostic tool for MCL, and may help in distinguishing it from other B-cell lymphoproliferative disoreders. Mantle cell lymphoma (MCL) is a subtype of non-Hodgkin's lymphoma (NHL), with aggressive clinical course, not so common reaching (5%–10%) of B-lymphoproliferative disorders (B-LPD), characterized by cyclin D1 expression and differentiated from possible morphologic imitators, comprising chronic lymphocytic leukemia/ small lymphocytic lymphoma (CLL/SLL) and follicular lymphoma (FL) by CD5, CD23, and CD10 expression,, as CD5 shared by both MCL and (CLL/SLL), but CD23 usually lacking in the former, while CD10 lands usually in FL. Nevertheless, CD23 negative CLL may also present. Lately, SOX11, plays a major role in neurogenesis and remodeling, also has been found to be detected in the nuclei of MCL cells. Recent studies showed that both SOX11 mRNA and protein highly expressed in MCL irrespective to cyclin D1.,, Furthermore, SOX11 showed to be expressed in more than 90% of MCL and in 100% of MCL with negative cyclin D1. In this work, we studied SOX11 expression in a group of B-LPD through immunohistochemistry (IHC) to investigate whether nuclear staining of SOX11 can serve as a useful diagnostic marker for MCL. The aim of this study was to evaluate the diagnostic role of SOX11 immunohistochemical expression in MCL. A cross-sectional study was designed; a total of 62 leftover tissue samples (paraffin block of bone marrow biopsy) were included in the study. All the samples were in use from the Medical city/teaching laboratories and presented during the period 2014–2016. Cases diagnosed according to the WHO classification of lymphoid neoplasms, with 26 cases having CLL/SLL, 17 were MCL, and 19 cases with FL. 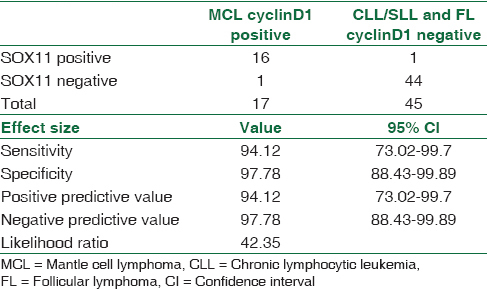 The diagnosis was made depending on flow cytometry reports and for MCL cases, diagnosis was confirmed by the demonstration of cyclin D1 expression by IHC. All the practical steps were carried out in teaching laboratories department of pathology and forensic medicine/Al-Nahrain University, College of Medicine. From each block, two sections of 5 μm thickness were taken; one section was immunohistochemically stained for SOX11 and the other for hematoxylin and eosin stain. Immunohistochemical procedure for SOX11: the procedure was carried out according to manufacturer's instructions. Taking sections and mounted on Fisher brand positively charged slides. Then, slides deparaffinized and placed in DAKO antigen retrieval (pH 6). Later on, labeled streptavidin-biotin staining kit (Dako) used for staining, used for staining, after blocking endogenous peroxidase, and incubation of primary antibody (abcam mouse monoclonal anti-SOX11 antibody [CLO142] ab154138) at 20°C overnight. A nonparametric two-way contingency table Chi-square test or Fisher's exact test was employed, using Prism 7 for Mac OS X software, version 7.0a (Graph Pad Software, San Diego, California, USA). The validity of SOX11 in discrimination of MCL than other LPD was calculated using sensitivity, specificity, and positive and negative predictive values. Nuclear expression of SOX11 in MCL, CLL/SLL, and FL is demonstrated in [Table 1] and [Figure 1]. 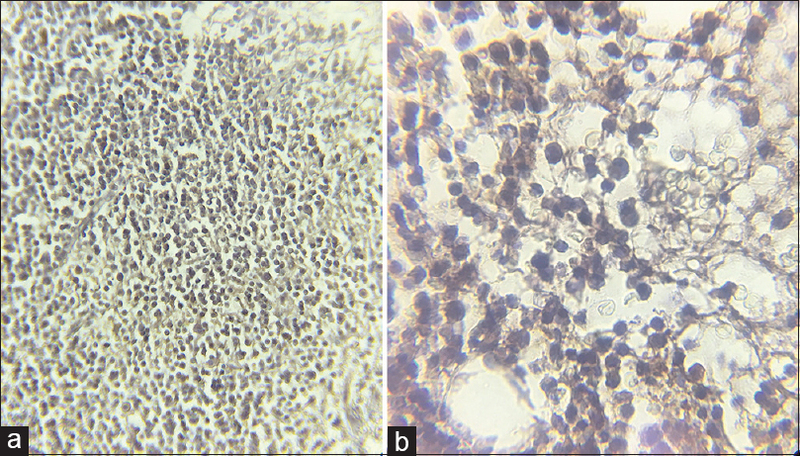 In MCL, nuclear staining of SOX11 was seen in 16 (94.12%) of 17 patients, and the staining was uniform and strong in mainstream of the neoplastic cells. 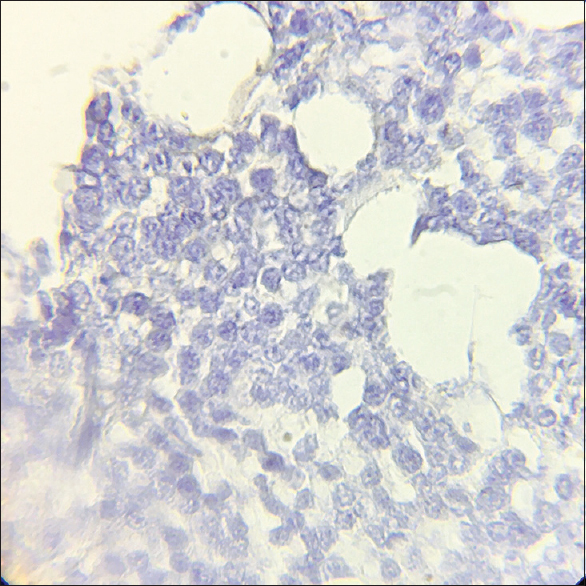 In the remaining, one case of MCL had lacked staining of SOX11 in both nuclei and cytoplasm. SOX11 nuclear staining was also seen in 1 (3.85%) of 26 CLL/SLL cases, with moderate nuclear expression and was negative in all (19) patients with FL [Figure 2]. Furthermore, compared with CLL/SLL and FL, the positive rate of SOX11 nuclear staining was significantly higher in the MCL samples (P < 0.001) [Table 1]. In addition, SOX11 nuclear positivity had high sensitivity (94.12%) and specificity (97.78%) in diagnosis of MCL compared to cyclin D1 [Table 2]. Nordström et al. studied different NHL subtypes and nonmalignant bone marrow lymphoid disorders using monoclonal SOX11-C1 and lead to conclusion that monoclonal SOX11-C1 improves sensitivity and specificity of MCL detection as 100% of MCL cases showed bright nuclear staining while other tissues were negative for nuclear staining. Our study showed that SOX11 is a powerful diagnostic tool for MCL and may help in distinguishing it from other B-cell LPDs. Ek S, Dictor M, Jerkeman M, Jirström K, Borrebaeck CA. Nuclear expression of the non B-cell lineage Sox11 transcription factor identifies mantle cell lymphoma. Blood 2008;111:800-5. Vose JM. Mantle cell lymphoma: 2015 update on diagnosis, risk-stratification, and clinical management. Am J Hematol 2015;90:739-45. Abdel-Ghafar AA, El Din El Telbany MA, Mahmoud HM, El-Sakhawy YN. Immunophenotyping of chronic B-cell neoplasms: Flow cytometry versus immunohistochemistry. Hematol Rep 2012;4:e3. Wang X, Asplund AC, Porwit A, Flygare J, Smith CI, Christensson B, et al. The subcellular Sox11 distribution pattern identifies subsets of mantle cell lymphoma: Correlation to overall survival. Br J Haematol 2008;143:248-52. Dictor M, Ek S, Sundberg M, Warenholt J, György C, Sernbo S, et al. Strong lymphoid nuclear expression of SOX11 transcription factor defines lymphoblastic neoplasms, mantle cell lymphoma and Burkitt's lymphoma. Haematologica 2009;94:1563-8. Lu TX, Li JY, Xu W. The role of SOX11 in mantle cell lymphoma. Leuk Res 2013;37:1412-9. Mozos A, Royo C, Hartmann E, De Jong D, Baró C, Valera A, et al. SOX11 expression is highly specific for mantle cell lymphoma and identifies the cyclin D1-negative subtype. Haematologica 2009;94:1555-62. Narurkar R, Alkayem M, Liu D. SOX11 is a biomarker for cyclin D1-negative mantle cell lymphoma. Biomark Res 2016;4:6. Swerdlow SH, Campo E, Harris NL, Jaffe ES, Pileri SA, Stein H, et al., editors. WHO Classification of Tumours of Haematopoietic and Lymphoid Tissues. Lyon: IARC; 2008. Fu K, Weisenburger DD, Greiner TC, Dave S, Wright G, Rosenwald A, et al. Cyclin D1-negative mantle cell lymphoma: A clinicopathologic study based on gene expression profiling. Blood 2005;106:4315-21. Zhang LN, Cao X, Lu TX, Fan L, Wang L, Xu J, et al. Polyclonal antibody targeting SOX11 cannot differentiate mantle cell lymphoma from B-cell non-Hodgkin lymphomas. Am J Clin Pathol 2013;140:795-800. Nordström L, Andréasson U, Jerkeman M, Dictor M, Borrebaeck C, Ek S. Expanded clinical and experimental use of SOX11 - Using a monoclonal antibody. BMC Cancer 2012;12:269. Chen YH, Gao J, Fan G, Peterson LC. Nuclear expression of Sox11 is highly associated with mantle cell lymphoma but is independent of t(11;14)(q13;q32) in non-mantle cell B-cell neoplasms. Mod Pathol 2010;23:105-12. Hsiao SC, Cortada IR, Colomo L, Ye H, Liu H, Kuo SY, et al. SOX11 is useful in differentiating cyclin D1-positive diffuse large B-cell lymphoma from mantle cell lymphoma. Histopathology 2012;61:685-93. Zeng W, Fu K, Quintanilla-Fend L, Lim M, Ondrejka S, Hsi ED. Cyclin D1-negative blastoid mantle cell lymphoma identified by SOX11 expression. Am J Surg Pathol 2012;36:214-9. Righi S, Pileri S, Agostinelli C, Bacci F, Spagnolo S, Sabattini E. Reproducibility of SOX-11 detection in decalcified bone marrow tissue in mantle cell lymphoma patients. Hum Pathol 2017;59:94-101. Palomero J, Vegliante MC, Eguileor A, Rodríguez ML, Balsas P, Martínez D, et al. SOX11 defines two different subtypes of mantle cell lymphoma through transcriptional regulation of BCL6. Leukemia 2016;30:1596-9. Swerdlow SH, Campo E, Pileri SA, Harris NL, Stein H, Siebert R, et al. The 2016 revision of the World Health Organization classification of lymphoid neoplasms. Blood 2016;127:2375-90. Wasik AM, Priebe V, Lord M, Jeppsson-Ahlberg Å, Christensson B, Sander B. Flow cytometric analysis of SOX11: A new diagnostic method for distinguishing B-cell chronic lymphocytic leukemia/small lymphocytic lymphoma from mantle cell lymphoma. Leuk Lymphoma 2015;56:1425-31.